How Do I View the Calendar? Make sure you are logged into the website. Then, click on the calendar tab on the top navigation bar. 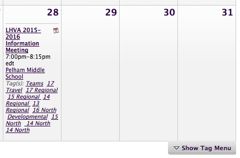 Once on the page, select the show TAG MENU (located at the bottom of the calendar). Select which teams you would like to view! Enjoy! Which membership should I be using? 1) What are the different memberships and which should I use? a) One day – $10. This is just what the name implies, a ONE day membership. It is currently only available to non-junior affiliated Adults and is NOT upgradeable or refundable. b) Tryout – $15. This junior membership is intended for use during the initial Junior tryout period. It is valid for up to five individual tryout days from Sept 9 - Nov 4 (boys only) or Nov 4 - Dec 14 (all juniors) . THIS IS THE ONLY UPGRADEABLE MEMBERSHIP, AND IS UPGRADEABLE TO FULL MEMBERSHIP ONLY. c) Regular / Junior membership. This is the normal membership for Juniors playing Club Volleyball. The memberships vary in price depending on participant age and level of options such as magazine subscriptions or under 8 (free) National Team Support etc.. This membership is NOT refundable, even if you do not make a team. 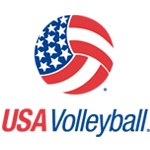 a) You must register and receive a membership number prior to attending any GEVA / USA Volleyball sanctioned event. 3) How do I prove my registration is valid? a) You should follow the directions on webpoint to print your receipt and membership card. Bring proof of registration along with the USAV Medical Release Form (available on website) to each event you attend. Jot down your password and keep it. It will make upgrade, changes in your registration, club selection, and renewal next season easier. 4) Why does my Tryout Registration say "pending"? a) Your tryout membership is good only for the current sanctioned tryout season dates listed above. It will show active before the first date. 5) I registered with a tryout membership, Why can't I print my membership card? a) (see above) Membership cards are only available to be printed for active memberships.